Wave the green flag to set the train on its ¾ mile winding through farmland and woods. There are four stations, each with paths and bridges over the track as well as the Adventure Treetop Walk. 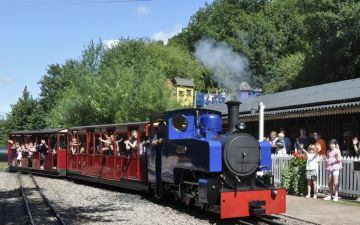 A trip takes just over 20 minutes but most passengers get off to go to the covered picnic and play area at Foxy Hollow - or to go treasure hunting - and return by a later train. 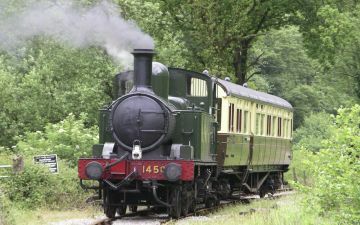 Extra rides are free - your ticket lasts all day and you can ride the steam train as many times as you like. Visit Mr Chuffy when he is here on holiday. Full of interesting animals, fascinating wildlife and exciting activities! 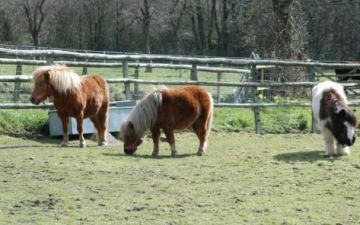 Visit pets corner and help feed the animals or, if you like running around, check out the indoor or outdoor play areas. Kids will have hours of fun in our very large heated Play Barn. There's more than 20-million trees in the Forest of Dean and it's home to Go Ape tree top adventure. Overcome fears or fuel an appetite for adventure across walkways, climbing nets and zip wires. Go it alone, thrill the whole family or explore the canopies with an experienced instructor from Forest of Dean Adventure. Dean Heritage Centre hosts The Very Hungry Caterpillar trail, which launches on Saturday 28th March 2015. From the creators of The Gruffalo, the popular children's story Superworm will come to Forestry Commission England's woods and forests in 2015. 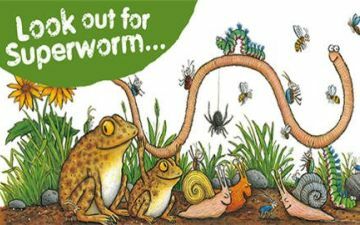 From 13 March until the end of October families can enjoy Superworm activity trails that include up to 10 stops and take around one hour to complete. Superworm's author, Julia Donaldson, commented: "There's nothing better than getting out into the wild as a family. I'm sure these trails will be really enjoyed by those taking part." Special Superworm packs are available from the shop at Beechenhurst Lodge, which will help you and your children get more out of the trail. Just a magical, unique, day out. 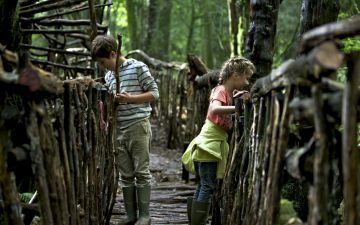 The magic could come from the maze of pathways winding through the gulleys of mossy rocks, twisted roots of the Yew trees, the bridges or lookouts and other things you can find on your way round the mile of meandering pathways on this 14 acre site. The ancient forest has been featured in Dr Who, Merlin and Atlantis to name but a few! 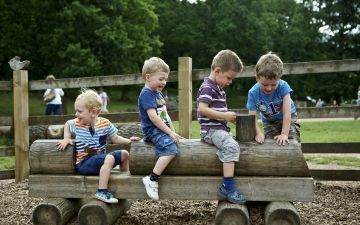 As well as the woods there are lots of animals, a willow maze, indoor mazes and a toddler racing track, an outdoor playground, plenty of picnic benches, a cafe and gift shop with lots of local crafts. 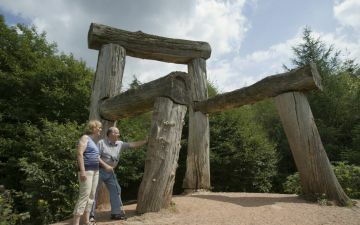 Starting point into the Forest Sculpture Trail with its stunning 18 huge sculptures for you to find. The 'must see' 15 ft x 10 ft stained glassed window 'Cathedral' hangs high in the canopy over the heads of walkers. See if you can find 'The Giants Chair'. Make sure the Giant doesn't come back whilst you are there. Ride, glide and travel seamlessly on a two-wheel all-terrain Segway vehicle at the National Diving and Activity Centre in Tidenham, where Segway Active teaches balance and poise before a spin around a purpose-built off-road circuit. 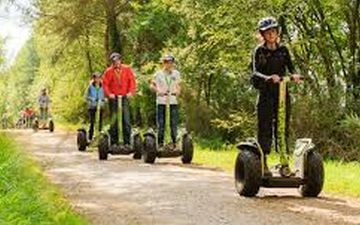 Segways are also available at Go Ape. The Friendly Forest Line! Steam along 4.5 miles through woodland. Experience the relaxing pace of a typical country branch line. With 5 stations along the way you'll have time to explore the local area, taking in woodland walks and country pubs or venturing down to the Severn estuary to explore Lydney Harbour with its fantastic views across the Severn. Visit Thomas The Tank Engine when he is on holiday here in the forest. 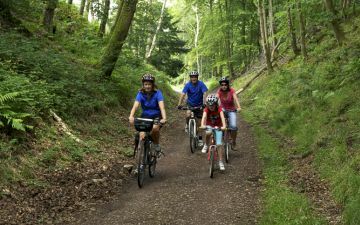 All Weather 11 mile Family cycle Trail or Downhill Challenges. Two wheels: best way to explore. An 11 mile gentle trail for the whole family or nationally acclaimed Verderers' Trail giving 7 miles of all-weather adrenalin. Try the Ski Run or the Corkscrew. Bring your own kit, we have secure storage, alternatively, hire all you need from Pedalabikeaway at Cannop 3 miles away. Or, book a guided ride too. 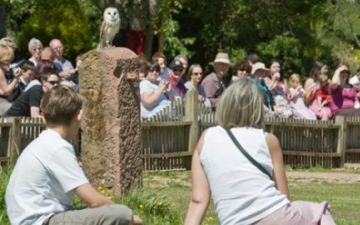 Watch amazing flying demonstrations at The International Centre for Birds of Prey, which houses over 200 birds of prey, eagles, owls, vultures, kites, buzzards and falcons. There are three different demonstrations each day each one different whatever the weather. Great photo opportunities. Experience days with the birds for those wanting to get closer and fly them. Run the rapids at Symonds Yat or take a lazy cruise through stunning scenery, either are fun and unique ways to experience the dramatic landscape that changes with every season. 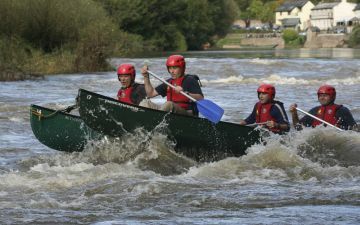 Team up with Wye Pursuits or Wye Canoes for boat hire, Expert tuition and guided river trips that guarantee a splashing good time. The Forest of Dean population is the largest of the breeding populations that now exist in England. 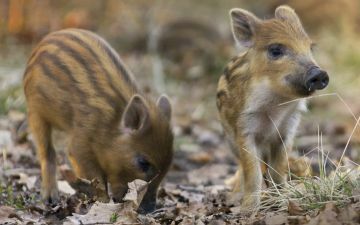 The original population established in woodlands near Ross-on-Wye after escaping from a wild boar farm in the area during the 1990's. The population has continued to grow steadily and there is now believed to be significantly in excess of 500, and most likely in excess of 800 animals in the Forest of Dean with the population expanding out into neighbouring areas, including into Monmouthshire and Herefordshire. 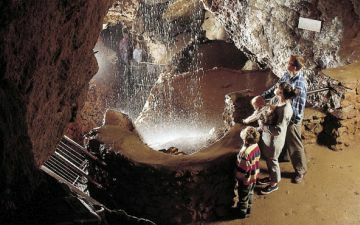 Clearwell Caves date back over 4,000 years, with nine fascinating caverns connected by a network of underground passageways - you can even venture 200ft underground as part of a 'Deep Level' visit!